Enzo Life Sciences, sussidiaria di Enzo Biochem, Inc, dal 1976 sviluppa tecnologie nella ricerca; sviluppa, produce e brevetta prodotti innovativi , piattaforme e servizi basati sulle tecnologie cellulari e molecolari. Enzo Life Sciences è marchio riconosciuto a livello mondiale per le tecnologie di labelling e detection nel settore della ricerca e della diagnostica. Il portafoglio prodotti comprende proteine, anticorpi, peptidi, molecole biochimiche, dyes per marcatura e kit, offrendo ai clienti soluzioni per identificazione/validazione di targets, analisi “high content”, espressione genica, detection di acidi nucleici , biochimica delle proteine ed analisi cellulare. Enzo Life Sciences, Inc., is organized to lead in the development, production, marketing, and sale of innovative life science research reagents worldwide. Now incorporating the skills, experience, and products of ALEXIS Biochemicals, acquired in 2007, BIOMOL International, acquired in 2008, and Assay Designs, acquired in 2009, Enzo Life Sciences provides over 25 years of business experience in the supply of research kits, biochemicals and biologicals “Enabling Discovery in Life Science™”. Enzo Life Sciences offers a comprehensive panel of innovative life science reagents. Antibodies, enzymes & proteins, small molecule inhibitors, product libraries, and ELISA and other assay kits are available for research in Cancer, Cell Death, Epigenetics, Genomics, Immunology, Neuroscience, Signal Transduction, and Ubiquitin & Proteasomes. 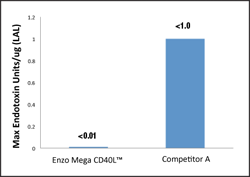 Learn how Enzo’s high-activity, low-endotoxin MegaCD40L™ construct is your best option for enhancing experimental immune activation. Enzo Life Sciences offers a wide range of custom services. Our innovative & experienced technical staff acquired extensive know-how over the last 20 years of business in custom production and brings professional project management skills to fulfill your needs on time and to specification. Our brand new state-of-the-art laboratories guarantee production of your life science product at the highest level.